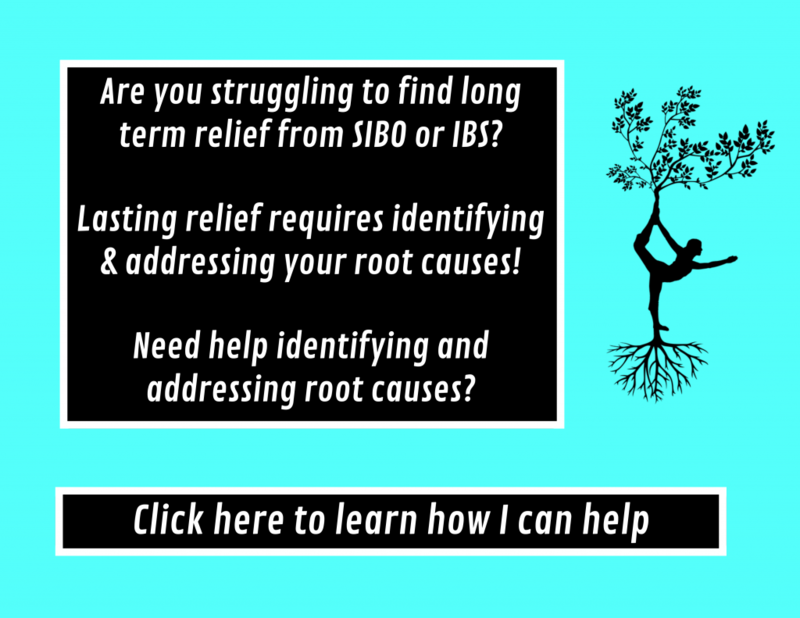 If you have read my blog in the past, you know that I am constantly trying to persuade fellow SIBO sufferers to search for the root cause of their SIBO! Obviously that can be easier said than done, but true healing can not take place without treating your root cause(s). I have been playing around with how to present the various root causes of SIBO and I decided to push my creativity to its limits and make an infographic. Below is the result!! It’s not super fancy, but I think it gets the job done! So, I basically lay out the major root causes of SIBO and the mechanisms behind each root that can lead to SIBO. I would also like to point out that the root causes are not mutually exclusive. You can have multiple root causes that need to be addressed. It takes being a health detective to treat SIBO! I hope this infographic can help you narrow down what the possible root causes might be for you! I plan on making another one with solutions and treatment tips for each root cause, so stay tuned for that! Click here to like the Facebook page so that you don’t miss any new posts! You can click on the infographic to see a bigger version. Until next time! Not sure how to address your root causes? I can help! Previous Previous post: Is the pursuit of diet perfection making you sicker? Next Next post: SIBO Sleuthing Infographic: The symptoms and testing that can help you find your root cause(s)! Hi Courtney! The root causes are the 10 bubbles in the infographic. Let me know if you are confused about the graphic and I can try my best to walk you through my logic. Thanks! I had my thyroid removed completely about 30 years ago. Though I take oral L-thyroxine daily I wonder if that could be my root cause – thyroid function??? Your infographic is amazing. Thank you! Thyroid dysfunction is common root cause of SIBO! I would definitely make sure that your thyroid hormone levels (free T3 especially) are in the optimal ranges during treatment! Best of luck! This is wonderful for SIBO sleuthing, especially for visual learners. It’s great to be able to see everything laid out to definitely rule out certain root causes to be able to further hone in on what may cause one’s particular SIBO. I think over the years I’ve had several “types” of SIBO, but thinking on it further, it’s probably more accurate to say various factors have caused my numerous episodes of SIBO. Thank you for this! I’m glad you found it helpful! Thanks for checking it out! Amy, thank you so much for sharing your personal experience. Very helpful. I have hashimotos & have done well with autoimmune Paleo diet, with the exception of my GUT. SO frustrating! Colonoscopy last year ok, but I feel like I’ve had chronic constipation/motility issues for years, but not sure if it could be SIBO or not?? You recommend the Organic comprehensive profile, but would it be better for me to do the stool test instead? Just want my best option for money. Thank you so much again for wanting to help so many like me. Gut issues are very debikutating. Hi Sue, I think their may be a bit of confusion. I recommended a comprehensive stool analysis which is a stool test. I apologize if this is not clear. I actually prefer the GI MAP test over other stool tests. Thanks for reading!